Traditionally the month of April is considered an "off-peak" season for hotels, while December through March is considered peak visitor season. A newly released report by the Hawaii Tourism Authority showed statewide increases in revenue per available room (RevPAR) and average daily rates (ADR). Maui County reported the highest RevPar in the state at $293 with an ADR of $371. The average occupancy rate is at 79%. 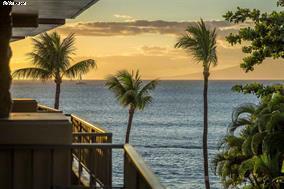 Wailea hotels have the highest daily room rates in the state at $575 ADR. The statewide averagae ADR is $217. The airlines have increased their seat capacity serving Hawaii with more daily flights. This has contributed to changing April from an "off-peak" month to a month of increasing hotel revenues. P.S. - Lower flood insurance premiums are available now that the Federal Emergency Management Agency has recognized Maui County's floodplain management efforts. The average premium cost dropped form $763 to $721 for Maui residents. P.S.S - Kapalua Bay Beach earned the number 1 spot on Dr. Beach's 2018 best beaches in America list. $1.249M (FS) Bank Owned - 4 bed, 4 bath home on iconic Front street. This home was built in 2005 and being sold "as is." $1.497M (FS) Bi-coastal views, Haleakala views, West Maui mountain views. Walk by the majestic monkeypod tree as you enter into the custom kitchen, cabinets built from local monkeypod, gas range, glass door cabinets, wine rack, microwave drawer and large monkeypod pantry cabinet in this 3 bed, 3 bath home. $2.595M (FS) Nestled among other multi million dollar homes in the exclusive Wailea Golf Estates gated community, this Front Row home bordering the Wailea Blue golf course offers fantastic panoramic ocean views, while still offering privacy. Open, spacious, and airy, lends itself to true Hawaii living. $3.5M (FS) This large oceanfront lot contains a 1955 built 3 bedroom Maui beach house and a detached 2 bedroom cottage, with a rare 500 plus sq ft storage room. The home has an owned PV and solar hot water systems. Fully permitted seawall and gated for privacy. Rarely available, this 3 bed, 1 bath central Kahului home features a large lot size with options to expand. Home's exterior is hollow tile. Plumbing and electrical were redone. Termite fumigation was done last year. The home was remodeled with new exterior and interior paint, vinyl plank flooring. This is your opportunity to live the idyllic Kula lifestyle at an affordable price. 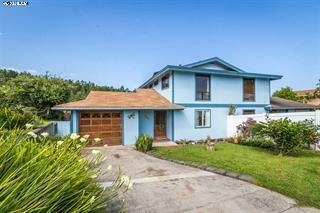 Nestled on the hillside with mountain and ocean views rests this newly remodeled 3 bed 2 bath home. The open floor plan kitchen and main living area flow seamlessly out through the French doors to the spacious lanai. $599.9K (FS) Bank Owned - Here's a sweet 4 bed, 2.5 bath home in a mature neighborhood close to everything: shopping, entertainment, fine dining, water sports. $624K (FS) Bank Owned - This contemporary home provides just the right amount of space. Interior features 5 beds, 3 baths, carpeted flooring on most of its rooms, and has lots of windows for natural lighting. It also offers patio, and built-in garage. $689.9K (FS) Bank Owned - Diamond in the Rough, great location for this 3 bed, 2.5 bath fixer-upper. Perfect for the contractor/investor or handy person, located in a beautiful residential neighborhood known and Kuaaina Ridge in Pukalani. Nice large fenced back yard is perfect for family and entertainment. $899K (FS) Paradise Found in Haiku. Perched at the top of a hill off Upper Ulumalu Rd you will find this charming 3 bed, 3 bath home with attached ohana situated on a mostly level 2 acre parcel. There are gorgeous flowers including a collection of ti leaf varieties, fish ponds, and lovely garden views. $1.1M (FS) Whaler 359 offers spacious living on Kaanapali Beach. This 1 bedroom suite has been full remodeled with specialty colored granite counter tops, stainless steel appliances, bamboo wood cabinetry, glass tiles in the kitchen and baths, walk-in shower and double vanity sink. This 3 bed, 2.5-bath has a beautiful garden-view, park-like setting. One of the very few units in Puamana with a carport for dedicated storage or convert to a garage for total coverage of your car. Newly painted with added touches. Live close to the beach, the three pools, tennis courts and the clubhouse with workout gym and the ocean pool. 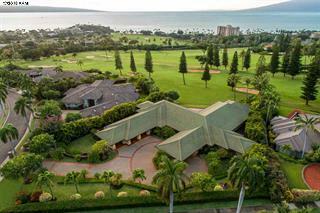 $1.375M (FS) Wailea Ekahi 5E, the art of living well! Set in one of Ekahi's finest locations and blessed with gorgeous views of the blue Pacific, the vibrant colors of tropical landscaping and the palm trees waving in the breeze, this private and serene 1 bed, 2 bath condominium is just a short walk from the beachfront pool pavilion. $2.745M (FS) From the second floor vantage point # 54 is perfectly positioned offering unobstructed views of the magnificent Pacific Ocean, Oneloa Bay, sunsets, the majestic island of Moloka'i and the world renowned Kapalua Bay course signature hole # 5. Enjoy the quiet and peaceful atmosphere of this 3 bed, 3 bath unit. Simply the best 1 bed, 1 bath (588 sq.ft) unit located at Maui Vista. Ground floor unit with access to the parking lot. The unit has been remodeled and ready for your final touch. This lovely, well cared for studio has incredible ocean and twin island views, delivering a calming and relaxed feeling as soon as you arrive. Remodeled with island themed furnishings, a hideaway Murphy bed that recedes for maximized space, with a rare full-sized kitchen making meal planning convenient and easy. $497.5K (FS) Hale Kamaole #150 sits in the most desirable sweet spot of this complex. This ocean view, easy access, ground floor unit in building 5 offers a private and quiet location within the complex. From the custom hardwood entry door you quickly know that this is a unique one bedroom home. $575K (FS) Nestled among the high-end and pricier hotels you'll find this laid back, ocean-front complex next to a small park and shops. This condo is beautifully furnished and has two bedrooms and two baths; along with a sofa bed, so it lets you sleep six. Great rental history. $929K (FS) This is a 2 bed, 2 bath unit with a spacious lanai and tropical views of palms trees and the Pacific Ocean. Unit 704 is on the north side of the complex and not exposed to road noise. It’s close to the pool, but far enough away to avoid pool noise. Both bedrooms and living room have been updated with split AC system. Bank Owned - Freshly painted 2 bed, 1.5 bath condo very near the ocean. Bedroom doors and metal screen door were recently installed. Upstairs unit. This popular Kihei Village condominium is in a great, convenient location near schools, resorts, golfing, shopping but most of all, walk to beach in 3-5 minutes. This remodeled upstairs 2 bed, 1.5 bath unit is in one of the best locations in the complex. Very bright, quiet and airy facing tropical landscaping. No one above you to keep you up at night. Upgrades include new flooring in the living room, dining room, kitchen and bathrooms, new toilets and updated vanities. $385K (FS) Beautifully renovated in 2015, this 2 bed, 1.5 bath downstairs, corner unit not only boasts a great location but also many custom upgrades. New custom colored wood cabinets, kitchen quartz countertops and custom made mango wood breakfast bar, along with stainless steel appliances make cooking and entertaining a joy. $498K (FS) A great opportunity in North Kihei. This is the last building of townhomes available, only 4 left. Brand new condominium homes. Townhome models are 2-stories and feature open-concept great rooms on the first floor, with a covered porch at the entry. This unit has 3 beds and 2.5 baths. $498K (FS) Ground floor 2 bed, 2 bath unit with very private, fenced in yard at Napili Villas. Remodeled in the past few years with granite countertops, stainless steel appliances, custom light fixtures and closet built-ins. $534K (FS) Kai Makani Beach Villas ground level unit with 2 bedrooms and 2 bathrooms. New Stainless Steel appliances were just purchased and installed. This floor plan is a open concept, that seamlessly transitions to the large ground floor lanai. Amenities include a heated saline pool, hot tub, fitness center, barbecue grills and bicycle storage. $450K (FS) Take a walk in the country! Build your dream home on this beautiful 1.86 acres in Haiku that comes with private water! Priced at county market value!